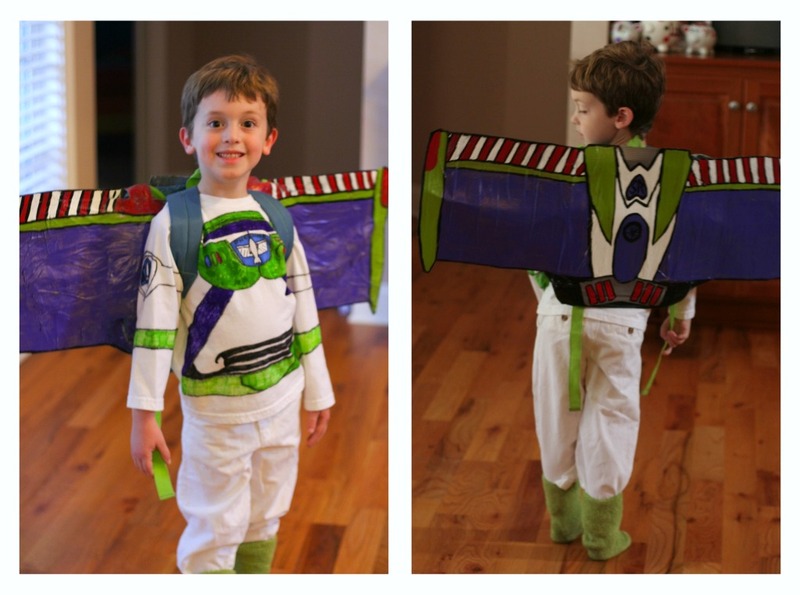 For Halloween my kids wanted to be Buzz Lightyear and Tinkerbell. Because I am cheap frugal, I cannot force myself to pay full price for costumes/dress-up. but those store-bought costumes aren’t the highest of quality and rarely make it to the next year. Then Lydia decided that she wanted to be Tink. 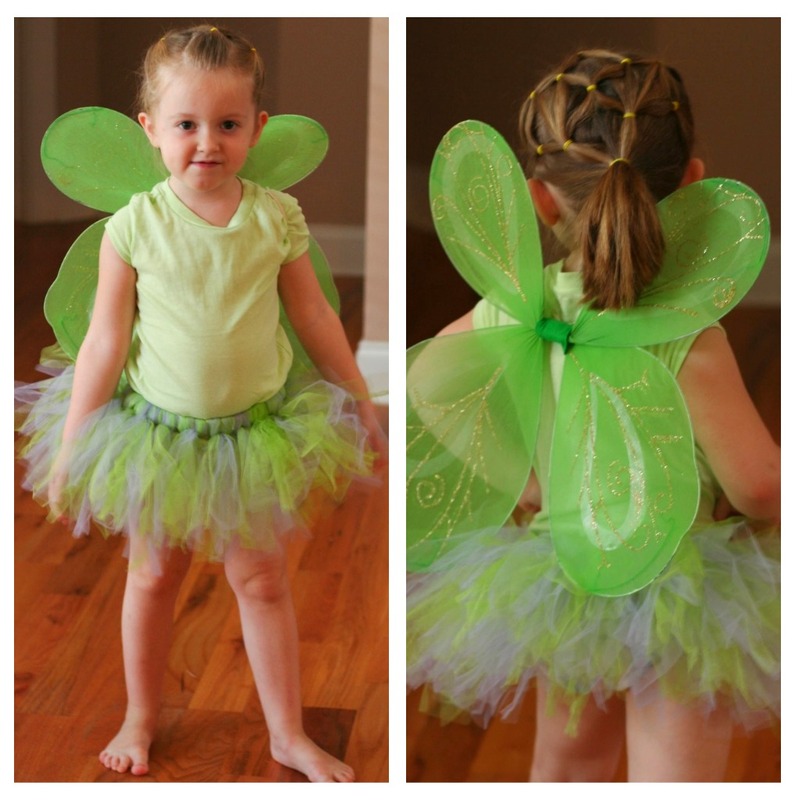 I bought her wings, fairy shoes and green tee shirt from the dollar store(as well as a glow-in-the-dark wand for fun). I had previously started making a tutu that I never finished. And I got a pair of green shorts from a friend and made them into a skirt. Over all, I don’t remember how much I spent on tulle and elastic, but I do remember that I got it on sale at Joann’s. The shorts were free, and the dollar store items were…well…a dollar each. Yes, I probably could have bought a Tink costume for only five more dollars, but look how cute she is! For Buzz? We happen to have about a million Buzz Lightyear items in our house and I used them as a guide. I took a plain white tee shirt($3.50 from Walmart) and hand-sketched a Buzz shirt with Sharpie. Then we colored it in with colored Sharpies, which was fun for all of us! I’d seen instructions in Family Fun on how to make fairy wings and thought I could use that same idea. I took 2 (24pack) Diet Coke boxes and opened them up flat. I taped them together and hand-sketched and cut out the basic shape of the wings. I used 3 basic hangers and bent them just a little so that none of the pointy pieces were sticking out. Then I duct taped those suckers to the cardboard, side-to-side long ways so that they went from one end to the other. Then I wrapped the entire thing up in duct tape. …you guessed it! Duct Tape. Because the paint so easily scratched off of my beloved duct tape, I covered it in a layer of mod podge. I finished it off with a white pair of pants he already had and a pair of my green socks over his shoes. There are no pictures of Asa because…honestly…he’s too little to care. He’ll be wearing a Woody “costume” (also known as pajamas that are 2 sizes too big). Now I have to ask how are those fairy wings hanging on her, as I can’t see the straps. OMG!!!!!! They look great!!!! I’m going to the dollar store tomorrow to get Bella some wings,cause honestly she can only wear the pair I have for her for a small time before I knock someone over with them. Her wings are huge! Also, a girl always need a few extra pair of wings right? Great Job! Awesome costumes at an awesome price! I saw the cutest green fairy shoes today at walmart. If we didn’t have a mission project tomorrow in atlanta, I probably would have bought them and brought to Lydia. Buzz, Tinkerbell, and Woody were the cutest kids at the Harvest festival! Great job, Mommy, on the costumes! You’re awesome! Fabulous!!! I made my own minnie mouse ears (but I really can’t brag about my savings, oops). I hope C, L, and A had fun all dressed up! Thanks for the idea to draw the details on a shirt–it worked great for my little guy’s costume this year!